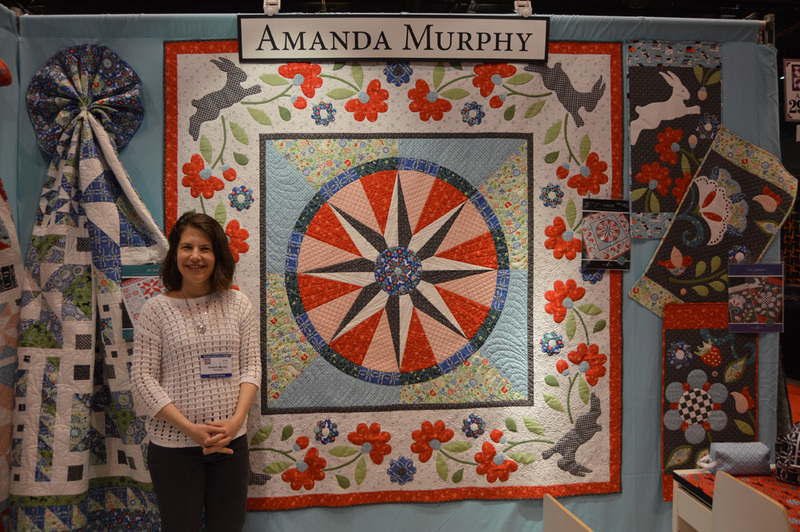 We've introduced you to Amanda Murphy's new fabric collection, Folk Art Fantasy, and given you a behind-the-scenes look at the prints, as well as plenty of inspiration from Amanda's quilt patterns. But we're not done! Follow along on our blog hop as four different designers share projects they've made using Folk Art Fantasy fabrics! We're posting a teaser here and then directing you to the full post on the designer's blog. 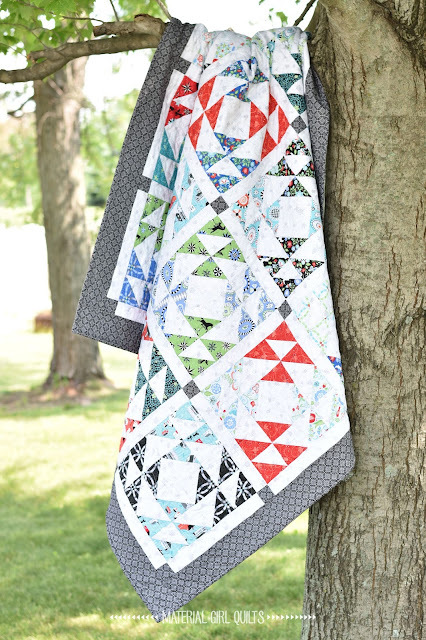 Today Amanda from Material Girl Quilts is sharing a tutorial for her Kaleidoscope quilt, a fun and fresh scrappy-looking quilt design. Here's a sneak peek--head over to her blog to find out how to make it yourself! Head over to Amanda's blog for the tutorial and find out how you can win a bundle of Folk Art Fantasy to sew with yourself! Click here to see the entire Folk Art Fantasy collection. 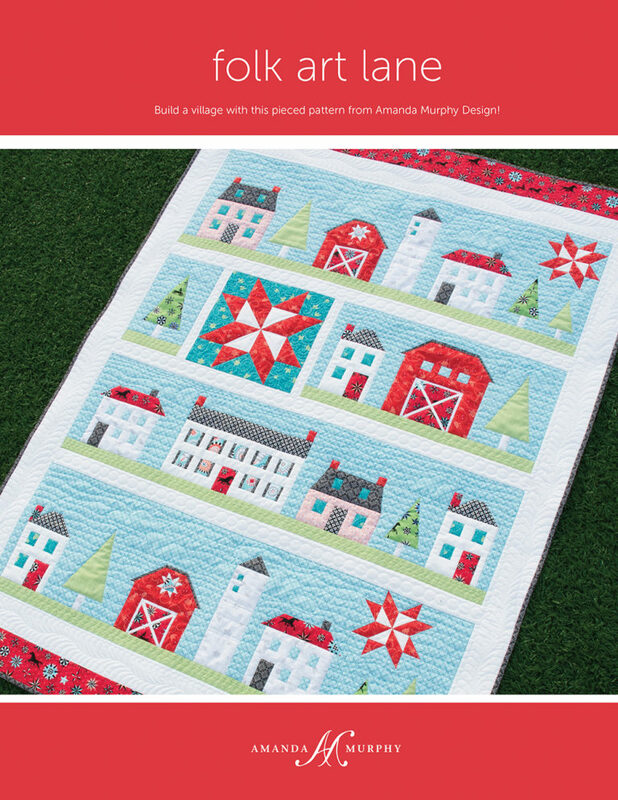 Click here to visit Amanda's website--see her patterns, read her blog, and follow her on other social media platforms. 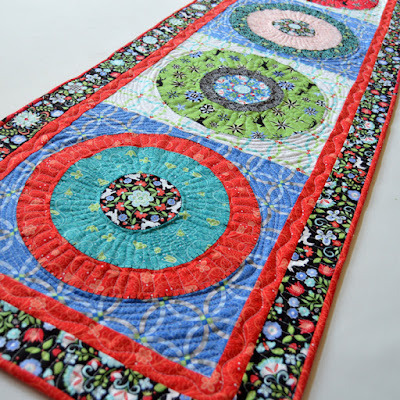 Follow along for all four days of our Folk Art Fantasy Blog Hop! 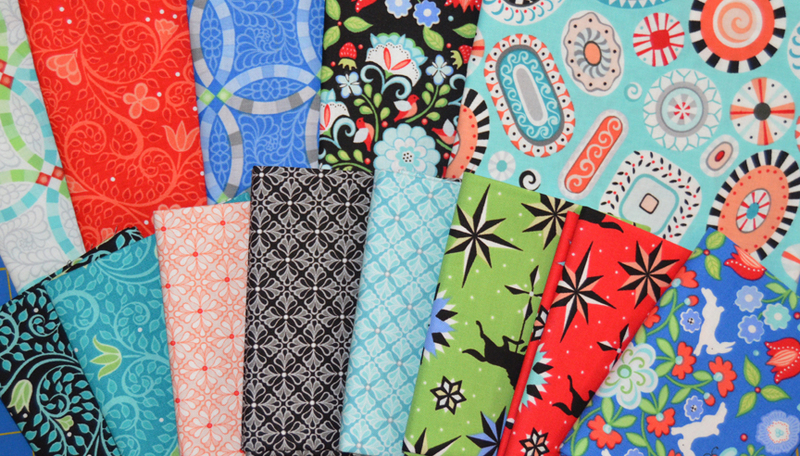 Today's teaser comes from Alison of Little Bunny Quilts. As you'll see, her blog name corresponds so well with both her placemat project and Amanda's focal print! She used precuts to create quick and easy placemats, with the ever-popular bunny taking center stage. 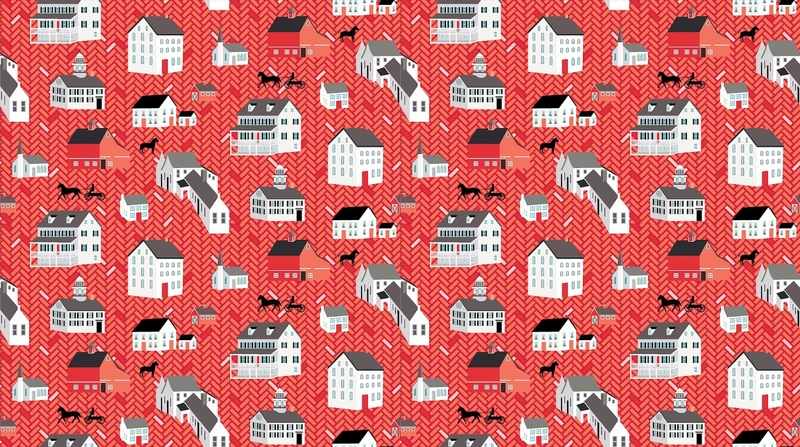 Alison says, "I have always loved Amanda Murphy's fabrics and Folk Art Fantasy might be my favorite collection thus far! 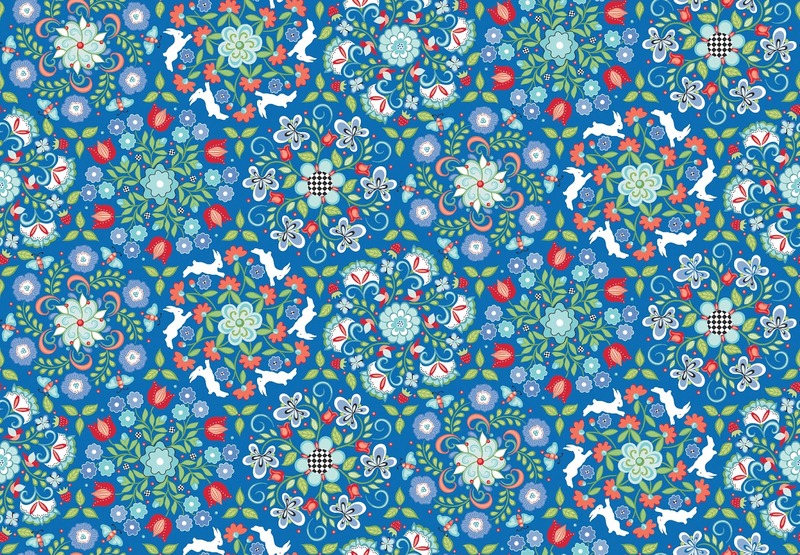 After seeing that the fabrics have one of my favorite things - bunnies - I decided to use the white bunnies in her prints as my design inspiration. I came up with an easy placemat pattern that uses 10" squares and shows off some of the larger prints in the collection. With two simple slices and little fabric waste, these placemats are a great go-to pattern for gifts or for finally using up some of those pre-cuts that we all tend to hoard! 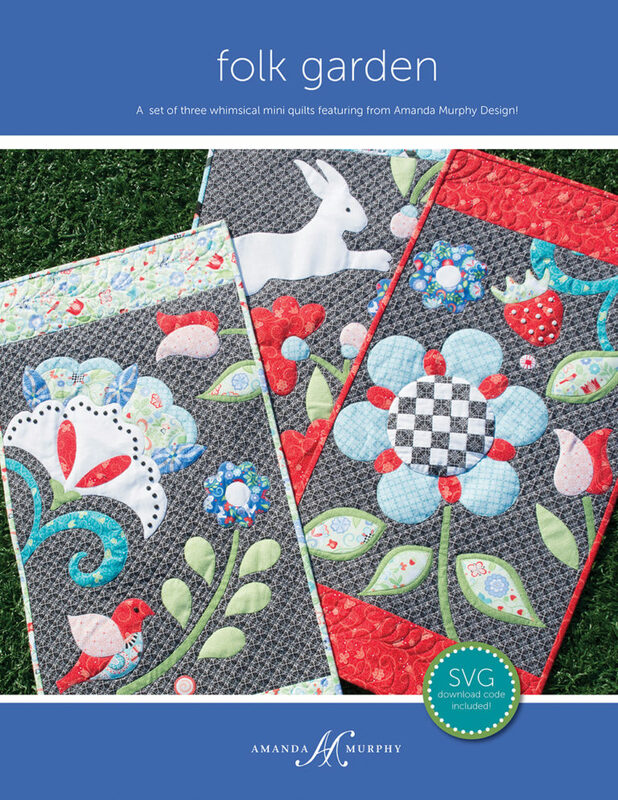 Head over to Alison's blog to see how to make these placemats, and find out how you can win a bundle of Folk Art Fantasy to sew with yourself! We've introduced you to Amanda Murphy's new fabric collection, Folk Art Fantasy, and given you a behind-the-scenes look at the prints, as well as plenty of inspiration from Amanda's quilt patterns. But we're not done! 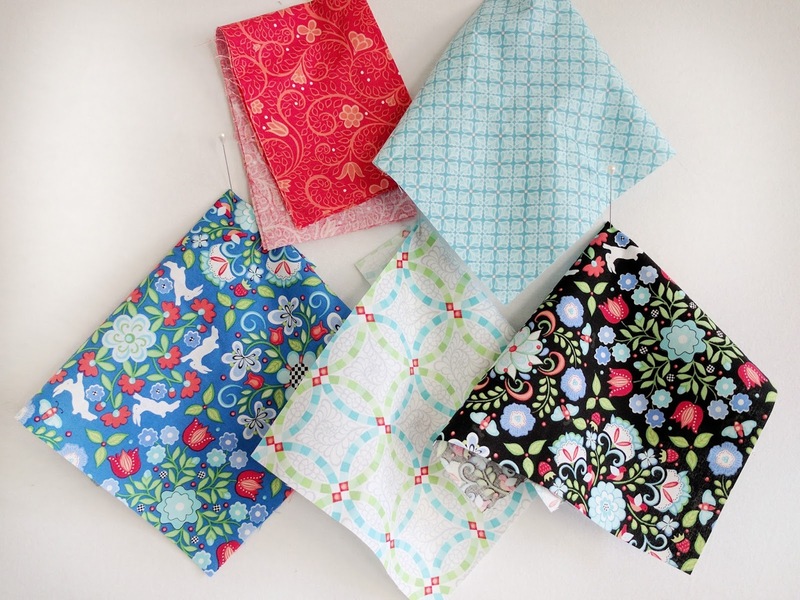 Follow along on our blog hop as four different designers share projects they've made using Folk Art Fantasy fabrics! Today's post will be right here on the blog, created by our blog design team. When we think "folk art," penny rugs come to mind (helped, no doubt, by Amanda's fun rug print, which we used as the backing for our runner!). 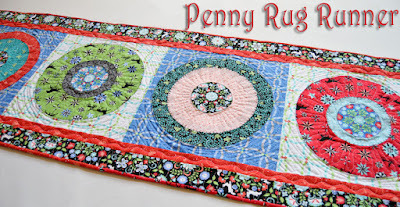 Below we are featuring a tutorial for a scrappy Penny Rug Runner. Enjoy! 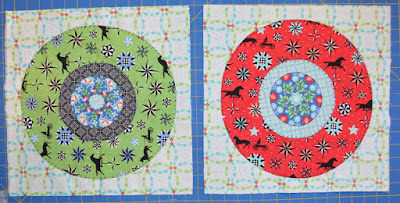 Finished size: 62-1/2" x 20-1/2"
Note: Click here to download the quarter circle templates. Step 1 Download the quarter circle templates here and print out. 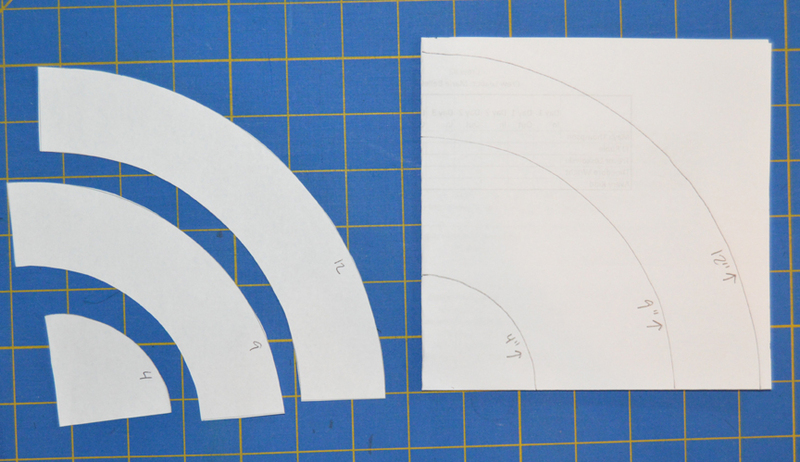 Cut out along all four curved lines (you'll have one quarter circle and three sizes of quarter rings). 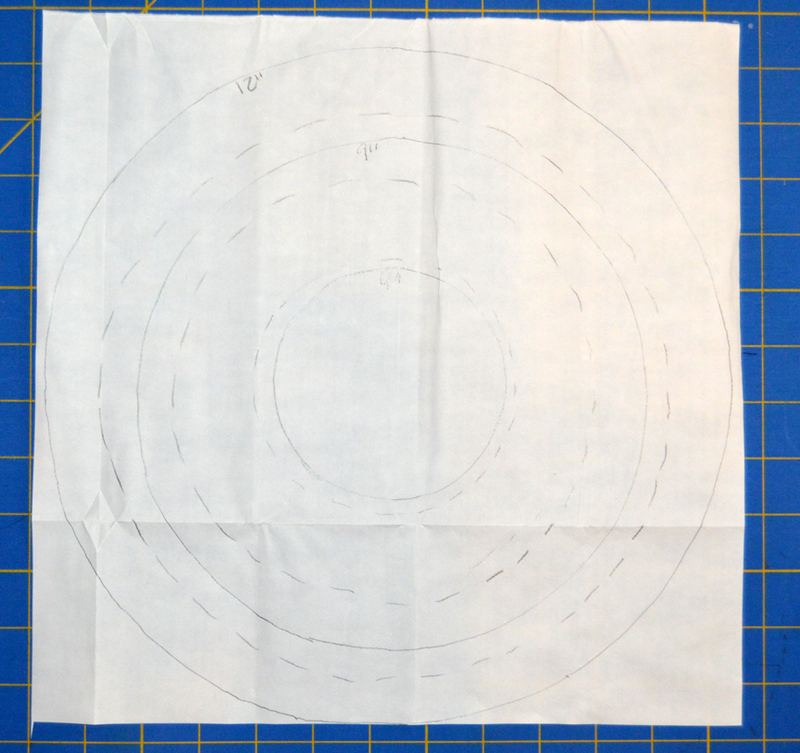 Step 2 To create the 4" diameter circle template, fold a 5" square of paper in half and in half again. position the right angle corner of the smallest curve on the two folded edges and trace the curve. 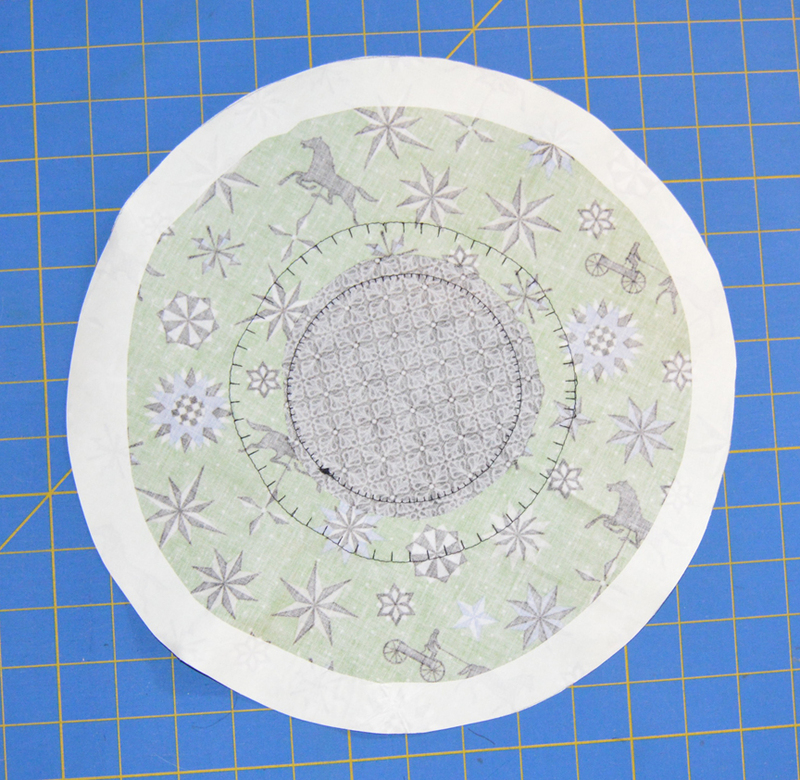 Cut along the curve through all four layers and unfold to see your 4" circle template. Repeat with remaining three circle sizes, using a piece of paper 1" larger than the circle size. Note: We conserved paper by tracing multiple sizes of templates onto one 13" folded square of paper. You'll end up with template rings for the larger sizes, but that's fine--you only need the curved outer edge for tracing. 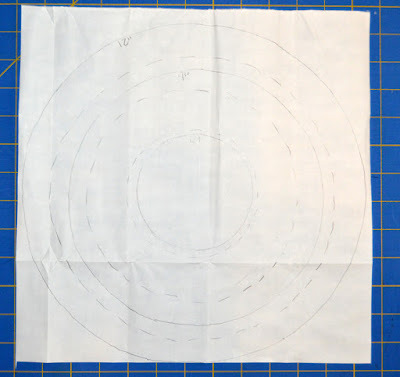 Step 3 Trace the 12" diameter circle onto a 13" fusible web square. Center and trace the 9" circle inside. Center and trace the 4" circle inside. This will allow you to nest templates on the fusible web and use it more efficiently. Make 2 sets of fusible shapes. 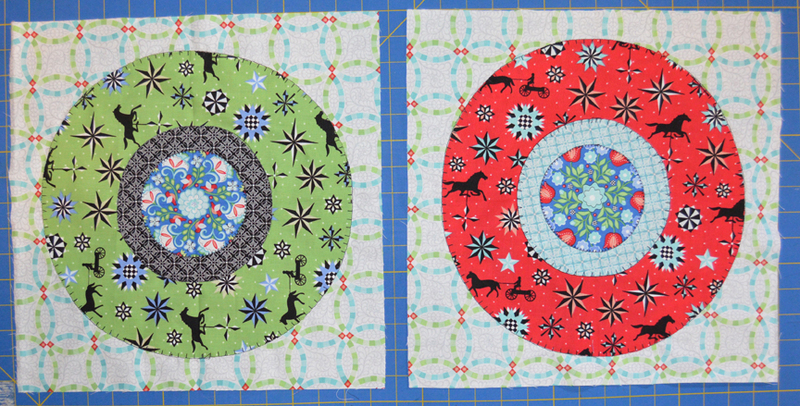 Draw dotted circles roughly 1" in from both the 12" and 9" circle templates as shown below. Draw another dotted line roughly 1/2" beyond the 4" circle line. These will be your cut lines, allowing you to use the window technique and eliminating bulk in your blocks. Note: If this seems too confusing, you can simply trace each circle onto a separate piece of fusible web and cut out roughly 1/2" outside the circle line and 1" inside the circle line. 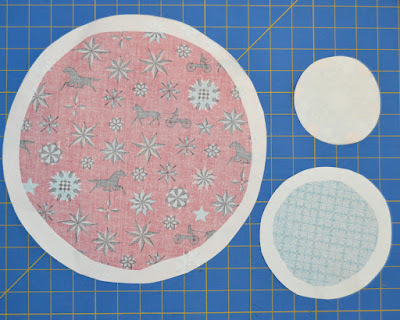 You'll use more fusible web and have more scraps left this way, but it's simpler if you're having trouble visualizing the nesting and dotted line cutting we've shown. Tip: If you're not familiar with the window method of fusible web, basically rather than adhering fusible web to the entire back of a large shape (like the 12" circle), you fuse a ring to the back of the fabric. 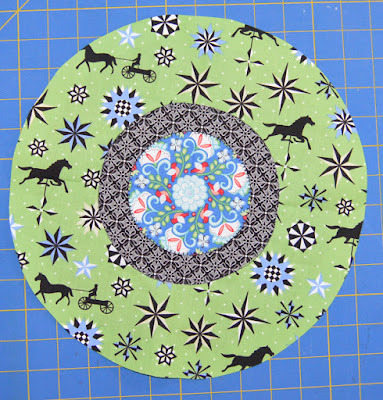 The inner edge of the fusible ring doesn't need to be perfect--it won't show. The outer edge of the fusible ring should be roughly 1/2" past the drawn circle line to allow for smooth cutting like in typical fusible applique techniques. (See the photo after step 6 for a visual). This reduces bulk in your finished project and keeps it softer than it would be if you used multiple layers of fusible web, which become stiff. Step 4 Cut along the dotted lines of both sets, creating (2) 12" diameter ring fusible shapes, (2) 9" diameter ring fusible shapes, and then (2) 4" diameter circle fusible shapes. Step 5 Repeat steps 3 and 4, substituting a 7" diameter ring for the 9" ring. Make 2 sets of fusible shapes and cut as directed in step 4. Step 6 Fuse one 12" ring to the wrong side of a 13" red stars and horses square. Cut on the drawn line, creating a circle. 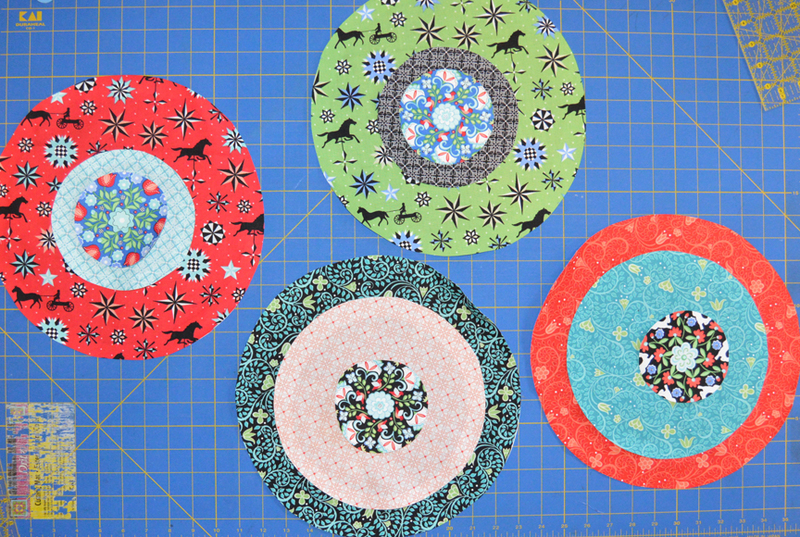 Repeat with smaller two sizes of circles, adhering each to a square 1" larger than the fusible shape (refer to photo and cutting list to match up correctly sized templates with fabric squares). Step 7 Repeat step 6, creating the following layered circle combinations (note: they're not fused together yet--this is just for show). You'll have (2) 12" circles with a 9" and a 4" circle on top, and (2) 12" circles with a 6" and 4" circle on top. 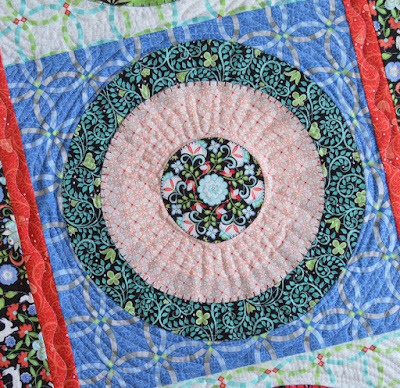 Step 8 Fuse the periwinkle medallion circle to a 6" black diamond circle, folding each circle into quarters and matching up finger pressed fold lines to ensure centered placement. Use a blanket stitch to secure in place. 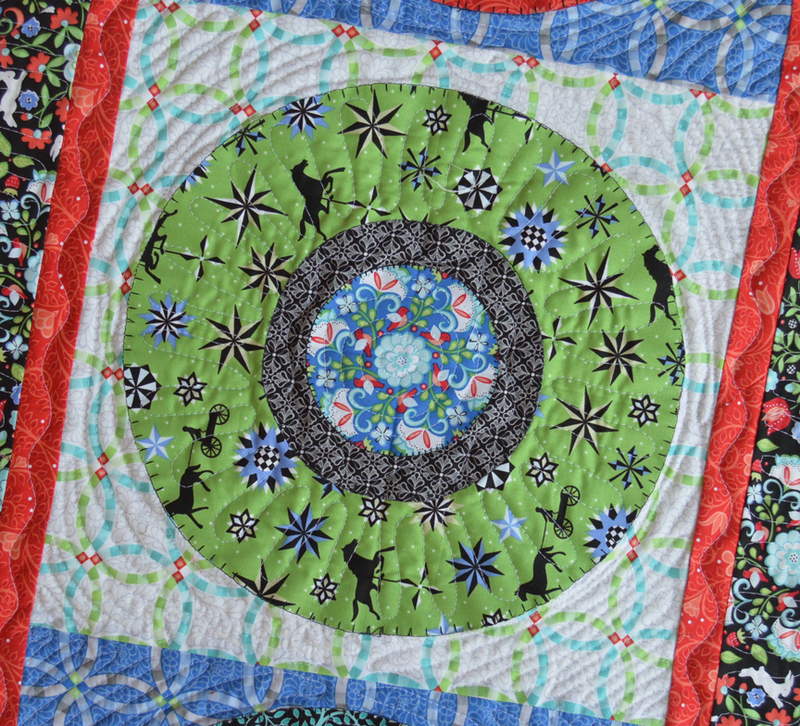 In the same manner, fuse the black diamond circle to the 12" green horses and stars circle and blanket stitch to secure. 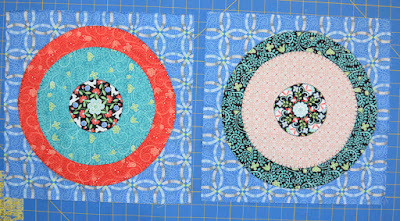 Step 9 Flip the layered circles over and cut out the green background fabric inside the blanket stitched line as shown below. Be VERY CAREFUL not to cut through the center fabric. Step 10 Repeat with remaining sets of circles for a total of (4) circle sets. Fuse (2) circle sets to 14-1/2" white wedding ring squares and (2) circles to 14-1/2" periwinkle wedding ring squares as shown. Blanket stitch to secure. Step 11 In the same manner as in step 9, flip each block over and cut out the wedding ring backing fabric inside the stitching line. 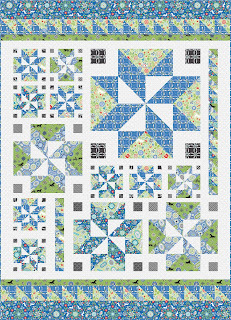 Step 12 Sew the 4 blocks together into a row, alternating background colors. Step 13 Sew (3) 1-1/2" x 42" red leaf strips short ends together into one long strip. Cut into (2) 56-1/2" lengths. Sew to the long sides of the runner. Cut the remaining strip (2) 16-1/2" lengths and sew to the short ends of the runner. Step 14 Sew (5) 2-1/2" x 42" black medallion strips short ends together into one long strip. Cut into (2) 58-1/2" lengths and (2) 20-1/2" lengths. Sew the longer strips to the long sides of the runner and the remaining strips to the short ends to complete the runner top. Step 15 Layer the backing right side down, batting, and quilt top right side up.Baste the layers together and quilt as desired. Trim the batting and backing even with the quilt top. Use the (5) 2-1/4" x 42" red leaf print strips to bind the runner. You're done! 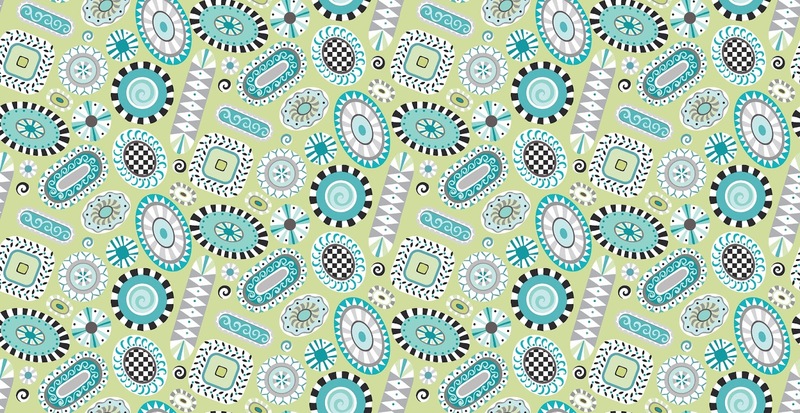 This concept would make a fun quilt as well--just a few (or a lot!) 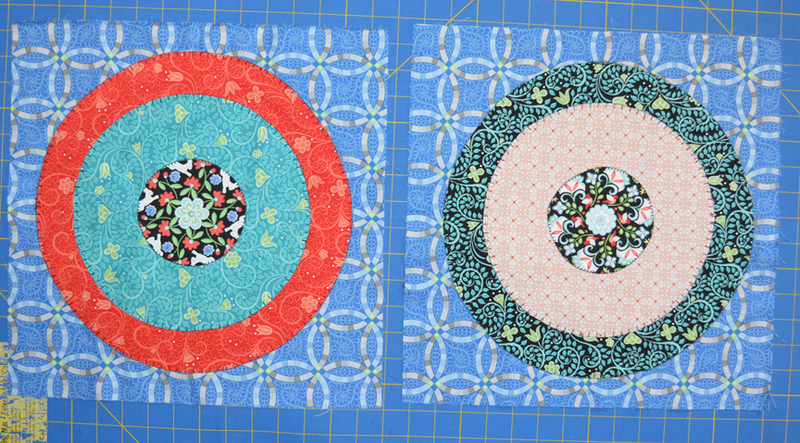 more circles to cut! You can really have fun quilting the different rings in this runner. For a chance to win a fat quarter bundle of Folk Art Fantasy, leave a comment below letting us know your favorite print in Amanda's Folk Art Fantasy collection. Giveaway is open through Saturday, June 30 at 11:59 pm EDT. We'll announce all four blog hop winners next week. 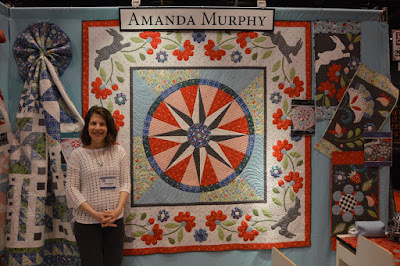 We've introduced you to Amanda Murphy's new fabric collection, Folk Art Fantasy, and given you a behind-the-scenes look at the prints, as well as plenty of inspiration from Amanda's quilt patterns. But we're not done! 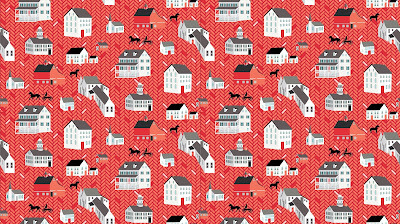 Follow along on our blog hop as four different designers share projects they've made using Folk Art Fantasy fabrics! We'll post a teaser here each day and then direct you to the full post. 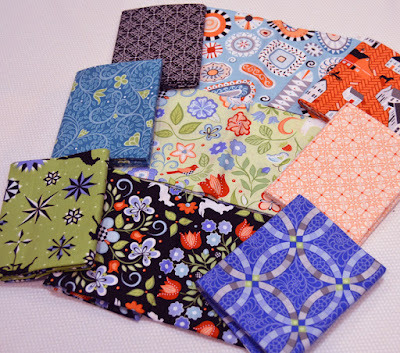 Today's teaser comes from Mandy of Mandalei Quilts. She says, "When Amanda asked me if I wanted to have a chance to work with her new line, Folk Art Fantasy, I had to say yes. Her designs always are cute, have sweet little details, and blend together so well! I picked a few of my favorite prints and got right to work on a gift (or three) for my mom. Come on over and check it out!" Mandy's photo only serves to enhance the mystery...we can see what fabrics she chose, but no hint as to what she stitched! Head over to her blog to see what Folk Art Fantasy inspired her to make! 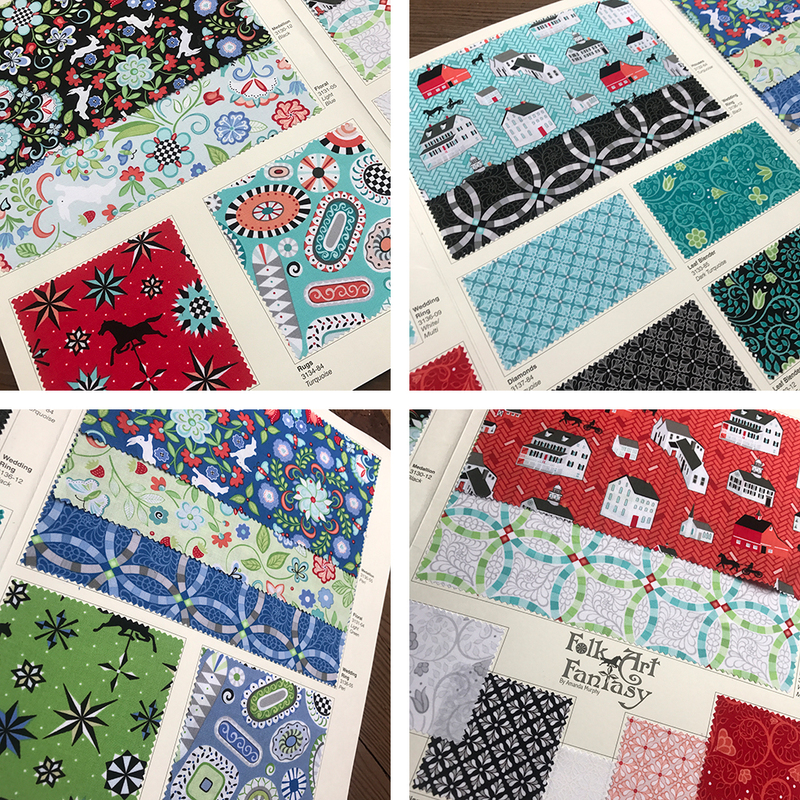 You'll also have the opportunity to leave a comment for a chance to win a fat quarter bundle of some Folk Art Fantasy fabrics! What would you do with a stack of these beauties?! 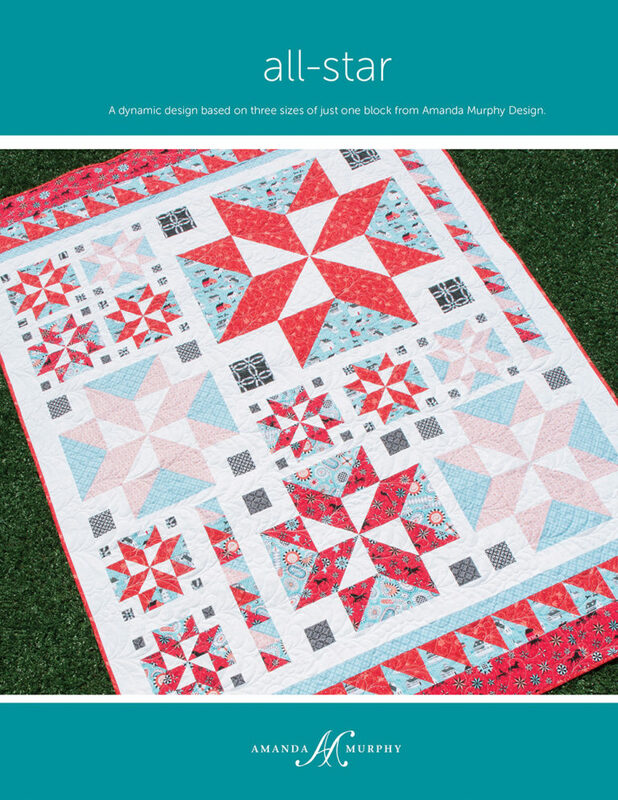 If you've been waiting eagerly to learn more about Amanda's new collection, Folk Art Fantasy, ever since our Quilt Market Recap, you're in luck! 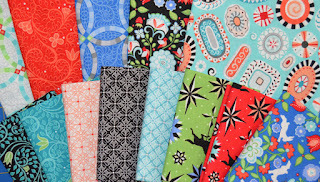 Today we're featuring an interview with Amanda and plenty of eye candy--fabric photos plus her new quilt designs! 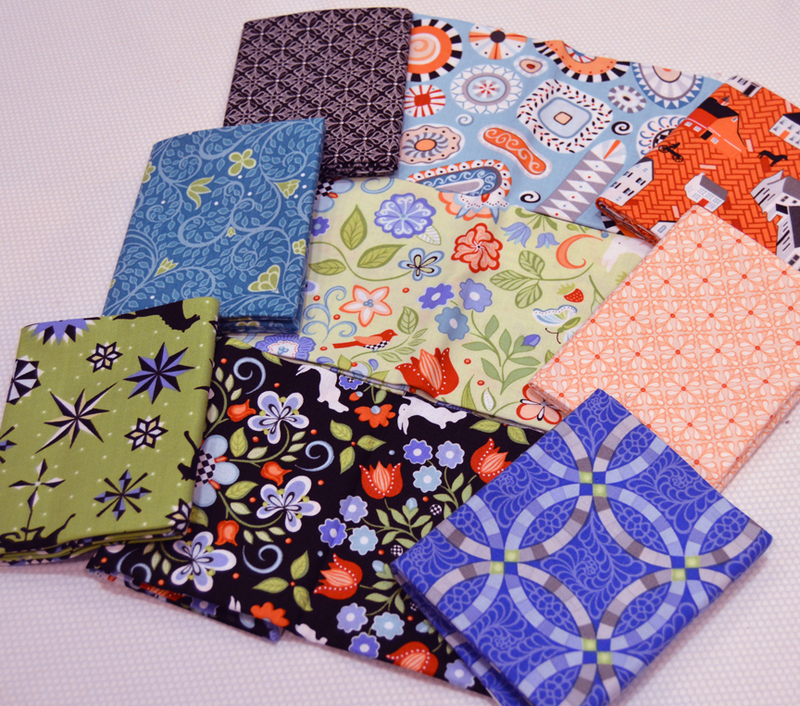 Stop by the rest of the week to see what some designer friends have created using Folk Art Fantasy fabrics! 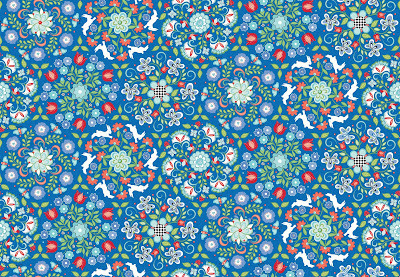 What inspired you to design the Folk Art Fantasy collection? 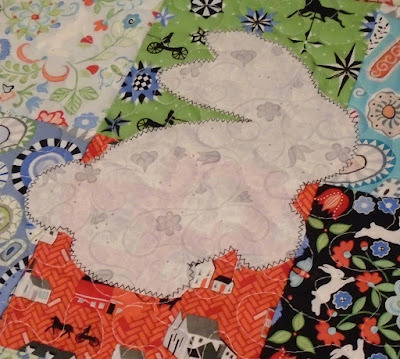 I love folk art in general, and quilts are part of that. 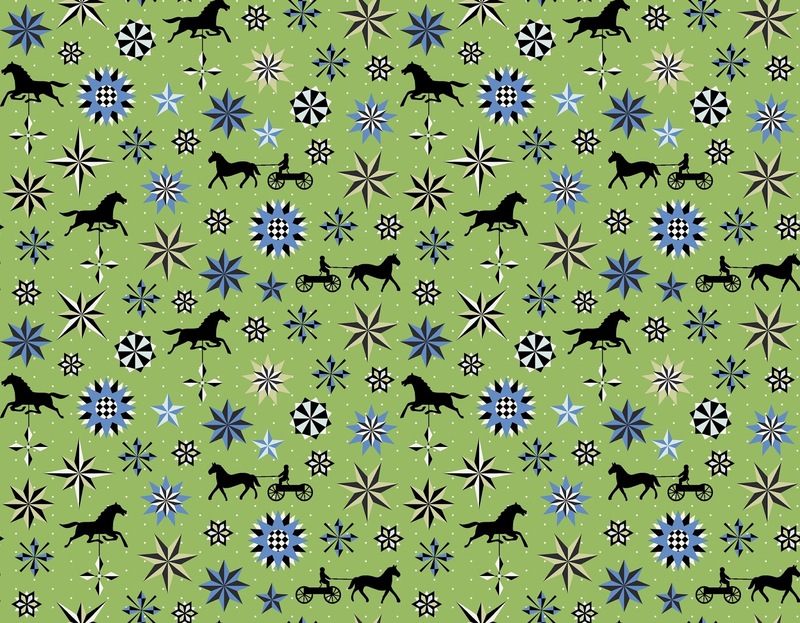 I wanted to do something that had the exuberance of folk art design, but not a literal interpretation. So much of the art was limited by what people could make (for example, fewer bright colors to work with). I wanted it to be about making things for the joy of making them, not necessarily the darker palette associated with folk art. It’s looser than a formalized traditional design. I definitely borrowed some folk art motifs, not just from quilting, but from cabinet making, painting and others. Let’s talk about the palette. When I was designing my Sewing Room collection, I was intrigued by what would happen with adding even more depth in the same shades. This collection was right for that more contrasted palette. And then I added in the deep blue/purple as well. I wanted the palette to be bright—show off the exuberance of creating folk art, making it more about the feeling. Also, the black and white prints have more prominence, and the other colors have to stand up to that combination. The rug print. 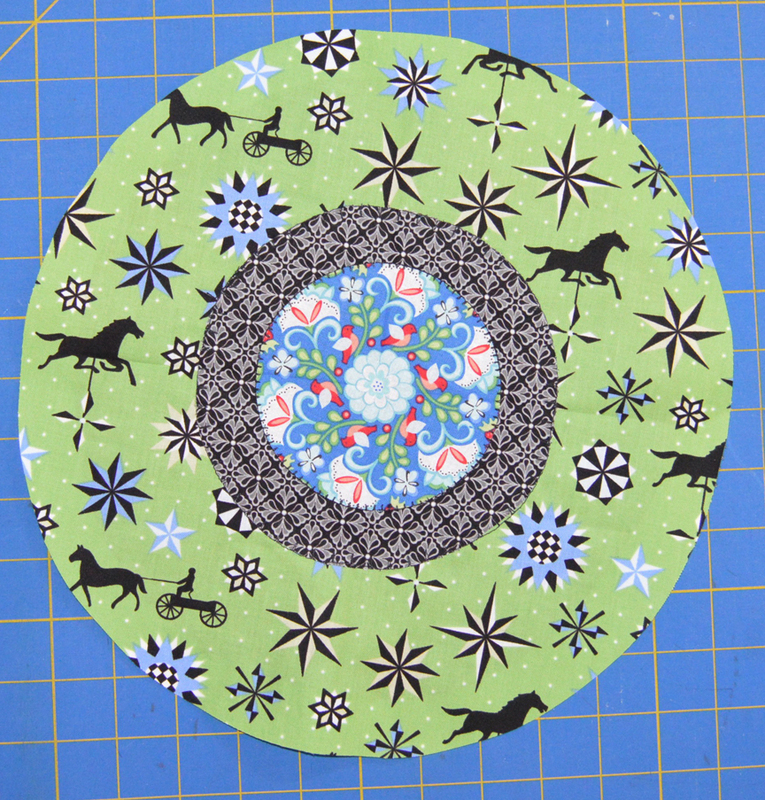 But I really like the medallion print as well—it offers so many opportunities for fussy cutting. I think the rug print makes the collection more modern. I see my designs as transitional—more modern, but grounded in traditional. The rugs are all hand drawn, with no perfect circles. They have so much contrast in them, and there’s lots of movement in the pattern. 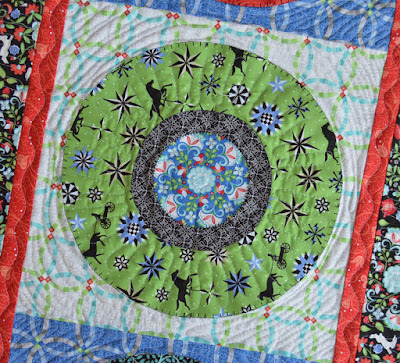 I think in the same way the rug print makes the collection more modern, the wedding ring print harkens back to more traditional quilting as folk art. Tell us about a few other prints in the collection. So many folk art paintings include houses, and many of those houses have an amateur feel, as if perspective was somehow disregarded. That wonkiness was intriguing to me, so I took that style of house and put a very modern background on it. When something pulls traditional, I go modern, and vice versa. It also allows you to mix the fabrics more easily. 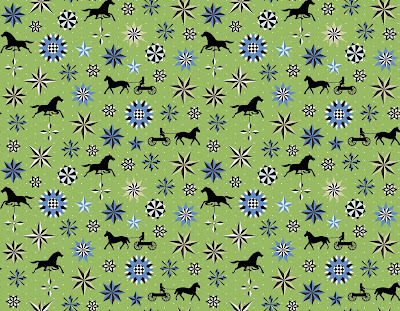 The star and horse print uses weathervanes, which are big in folk art, and stars. It actually functions well as a blender. We’ve drooled over your medallion quilt in every photo of your booth from Quilt Market. That’s my “Folk Lore” pattern. It’s the quilt that inspired the collection, and vice versa. The whole time I was designing the fabrics, I had the idea for a big medallion quilt with an appliqued border in my head. 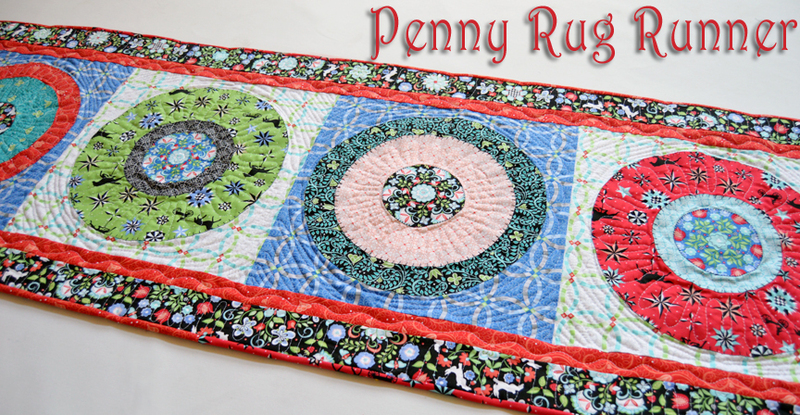 It has a modern feel because of the scale of the elements and because of how I quilted it. There are no Y seams, and you can purchase SVG files for digital cutting. 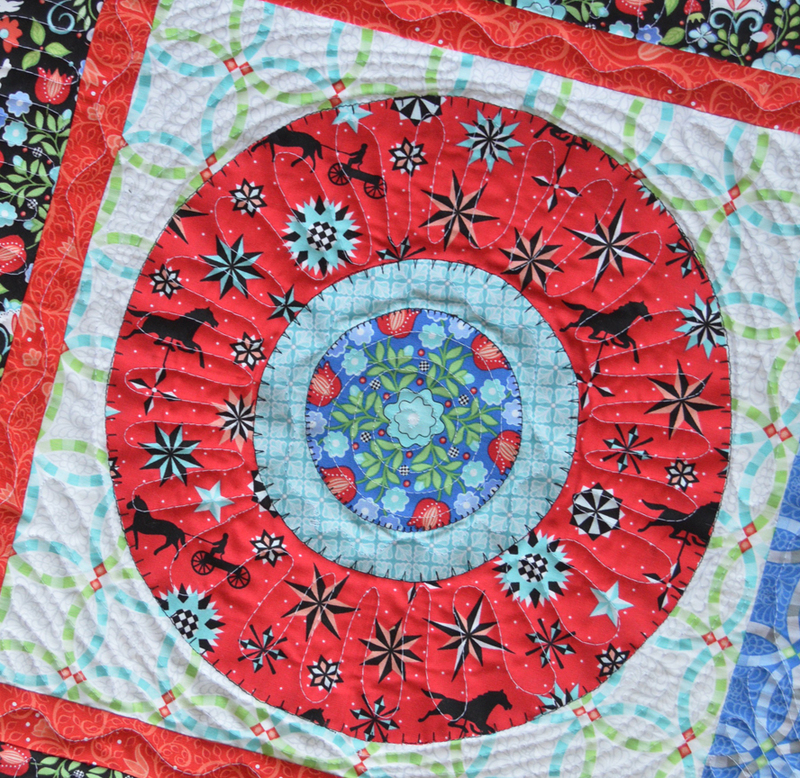 Speaking of applique, tell us about your “Folk Garden” trio. I always like to create a freeform applique piece that isn’t too fussy in placement. And because I’d done the “Folk Lore” border applique on a white background, I used black here to show a different look. Just Another Button Company has a button pack to accompany the design. 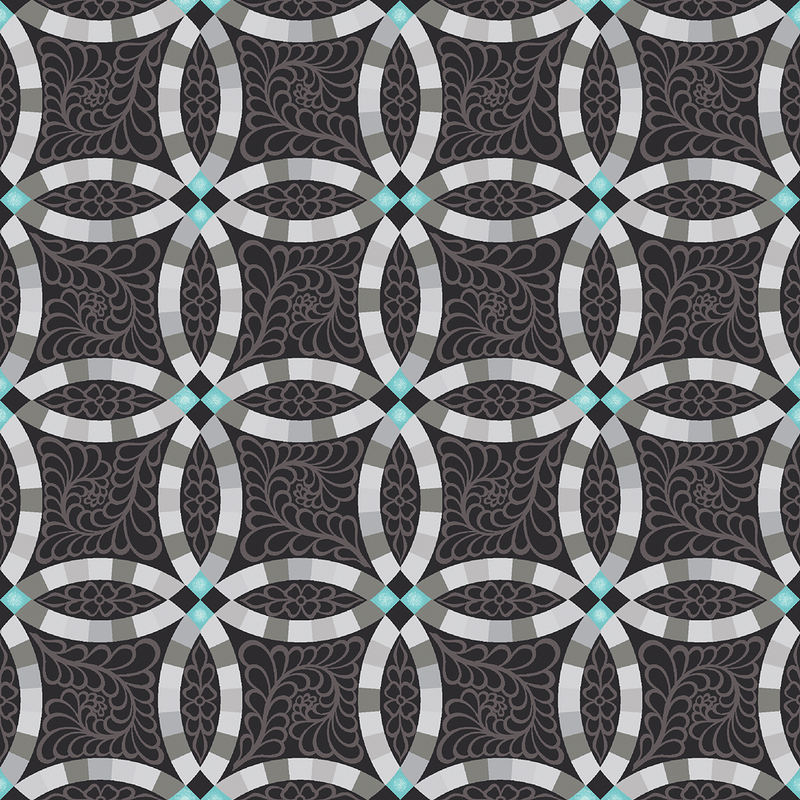 This pattern has SVG files for cutting as well. 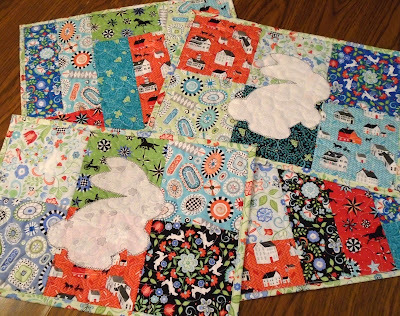 How about your other quilt patterns? My daughter predicted that “Folk Art Lane” would be the best seller of the bunch. It makes use of the blenders from the collection, and it’s all pieced. 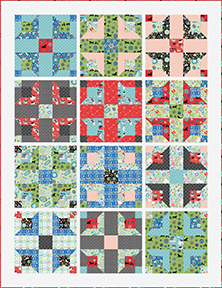 You can piece one row for a mini, break it up as a block of the month, or piece the entire quilt. 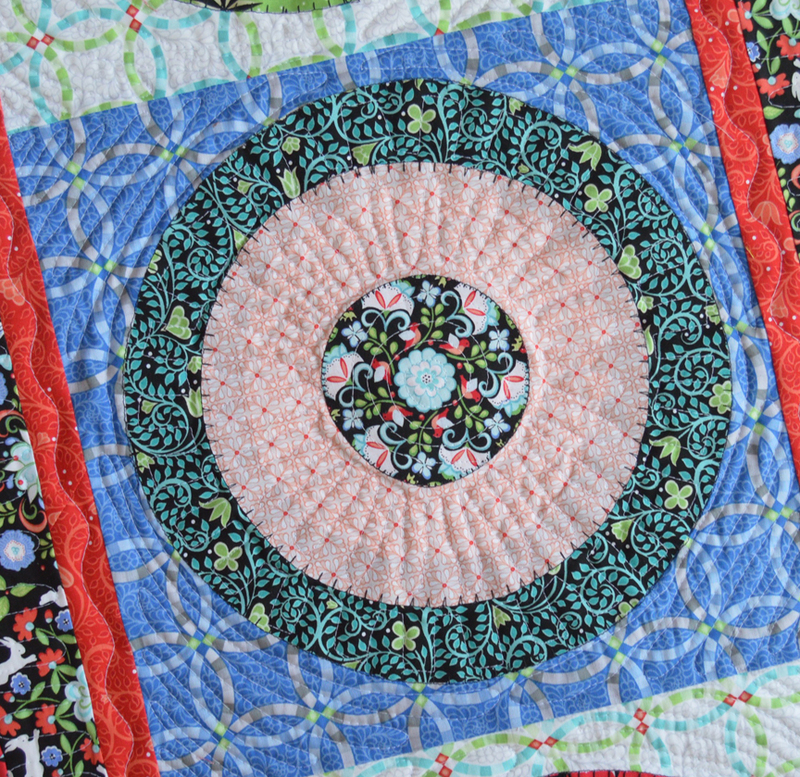 "Folk Art Flowers" is a one block quilt. It uses just 12 fabrics. I love the dimension in it. 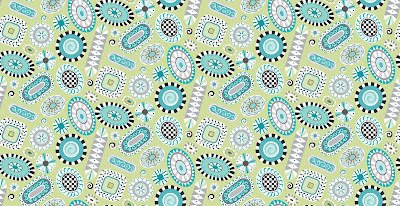 All the motifs there are digitized and they’re part of my traditional feathers quilting collection coming soon. The collections are digitized for both embroidery machines and long arms. 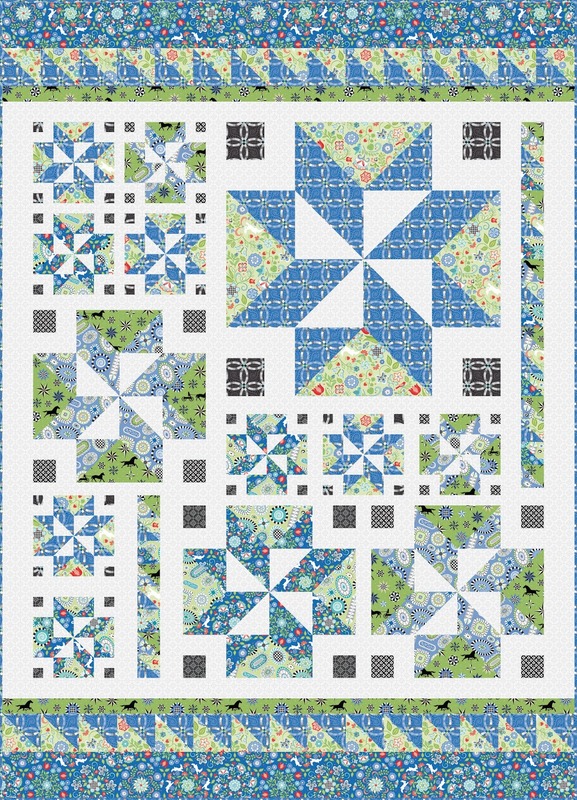 I always try to do a beginner quilt, and "All Star" is it. 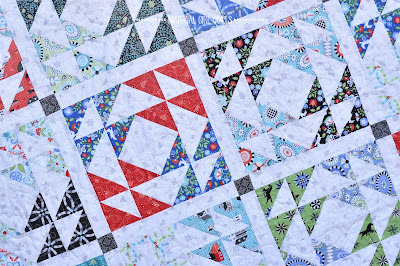 The design is all based off of one block, which is made from half square triangles. The quilt looks more complex because you make the block in different sizes. It’s actually a very simple block. I did it in two color stories—red/blue and periwinkle/green. 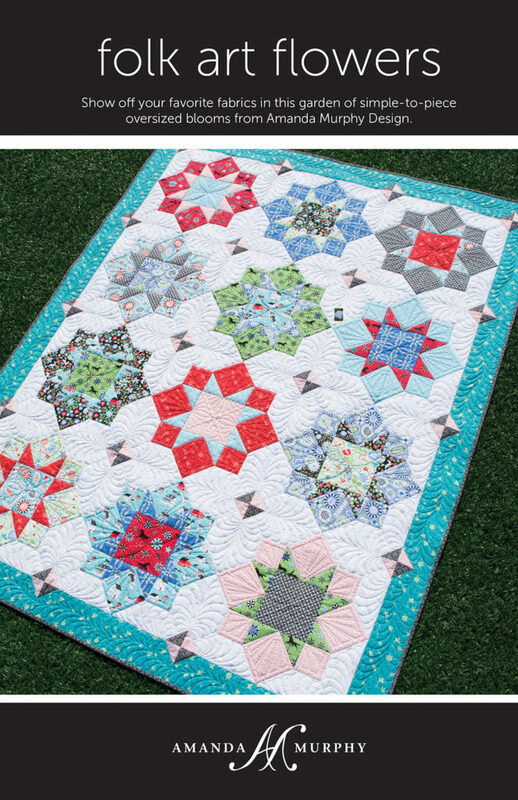 If you look closely, this quilt offers a good example of the rug print being used as a blender in the star blocks—it’s so much more interesting than a traditional blender! Ask for Amanda's patterns at your local quilt shop or click here to order them from her website. Amanda also designed the "Folktale" quilt pattern, which will be available soon as a free download from our website. Happy Friday! We're bringing a little rainbow action to celebrate the end of the week! 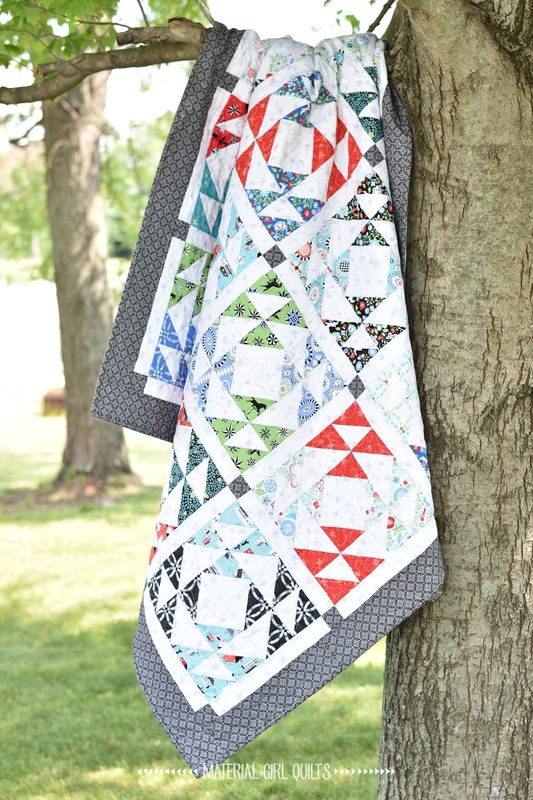 The beauty below, Staggered Strips, is a gorgeous and easy-to-piece quilt by Melanie Greseth and Joanie Holton, and it was recently featured in Quilts and More magazine. "Designed by Melanie Greseth and Joanie Holton. 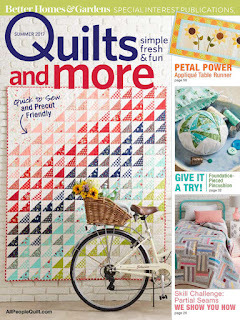 Used with permission from Quilts and More® magazine. 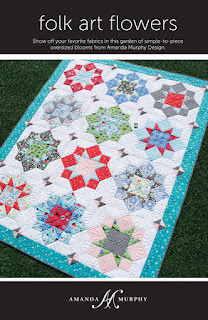 We asked Joanie to tell us about the Staggered Strips quilt. 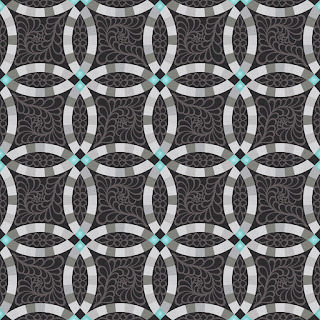 Tell us about working with the Zentastic fabrics. The colors appealed to us, definitely. They’re not your typical colors—it’s a very contemporary palette, so it was a challenge to make them work together without a focal print to tie them together. We viewed the whole line as the focus and worked to put them together. How did you develop the design? 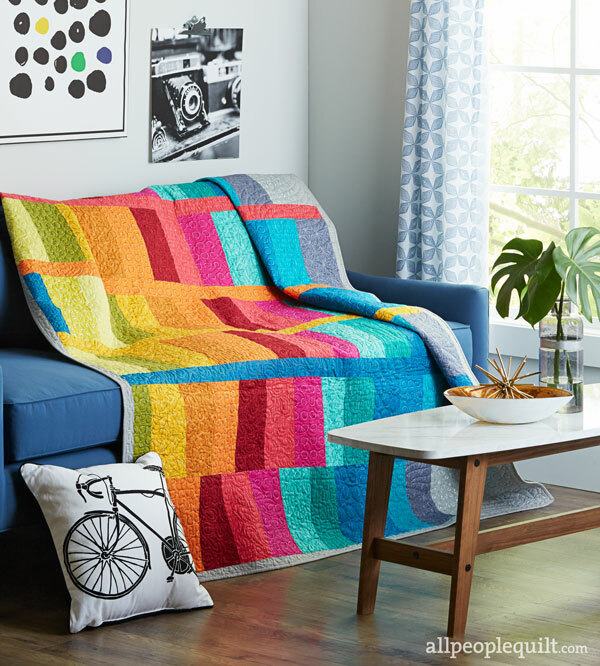 We wanted to keep it simple—a beginner quilt, but with a contemporary feel. As we started working with the prints, it became more about getting a cool design without a lot of piecing. We created that with the color wave concept that moves from side to side. As the design was coming together, we decided there needed to be something to break up the rows. My son Zack, sat down with me and together we started moving colors for the horizontal bands. It was his first quilt designing experience! The bars in the center rows create a visual break. How does the quilting enhance your design? Our quilter, Naomi Polzin, quilted each color grouping differently. She followed the curve of the colors, changing the design in each band, which helped enhance the purposefulness of the design. I like the way it all came together. And that it’s got a very contemporary feel to it. Tell us about the skinny blue rectangle on the left. It really adds a pop of color that works in the design! We originally tried the gray-blue over there (which would have continued the ordered pattern), but it just mushed—it didn’t work. The blue really pops against the greens. p.s. 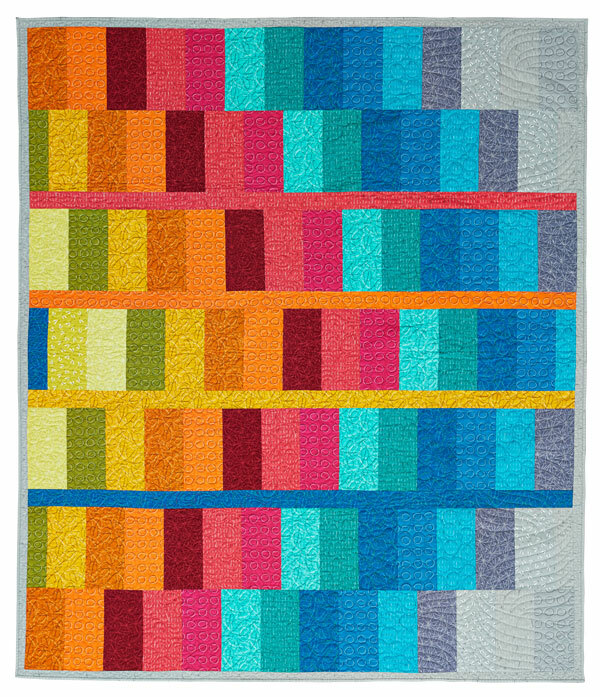 Wouldn't this quilt be fabulous in some of the Bali collections we've featured on the blog this week?!?! Click here to see the Zentastic collection. Click here to visit Melanie and Joanie's website. 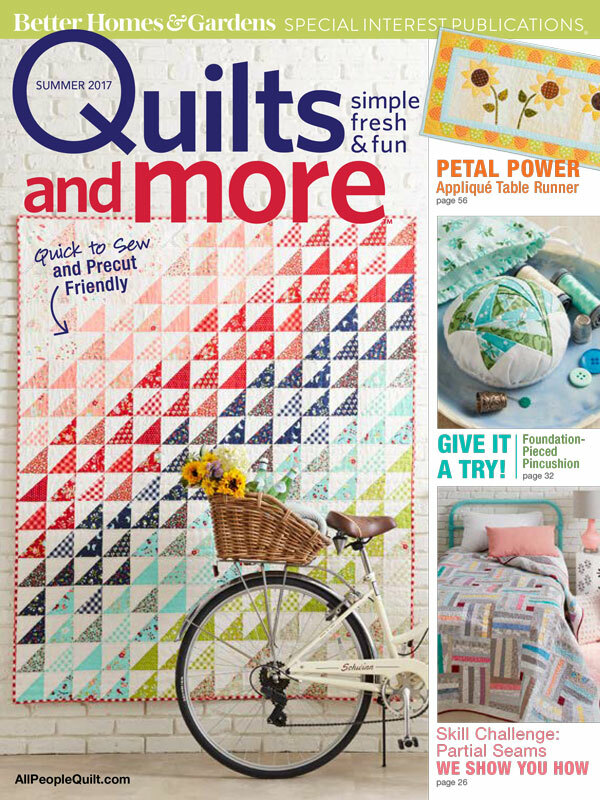 Click here to find the Summer 2017 issue of Quilts and More. 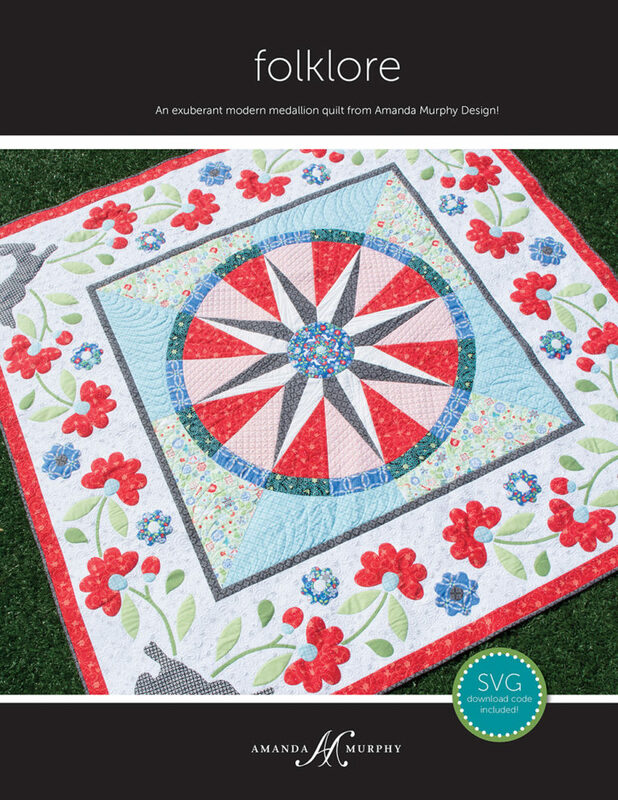 NEW Modern by the Yard issue!